Great holiday park suitable for the whole family. There is plenty for the kids to do, and its only a short walk to the beach. All staff are very friendly and made us feel VERY welcome. I would definitely recommend! Nice little caravan park. Chalets are self contained and in a beautiful location . 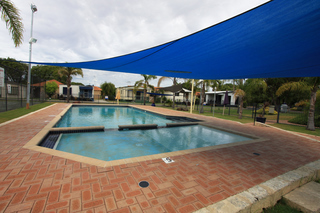 Great location opposite IGA shop and small shopping centre and Stilts pub and café. Perfect location for families as you can walk straight through to a calm sandy beach with no big waves and no need to cross any roads. The playground and pool provides hours of entertainment. The accommodation in Cabin 115 is a basic, clean 2 bedroom unit with fully functioning kitchen for any family wanting to self cater to keep costs down. Well maintained and nice facilities in a lovely location. From the Busselton Town Centre, proceed 6.5kms along Bussell Highway, Park is located on corner of Holgate Street (opp. Broadwater Shopping Centre & Food Hall) on the beach, no roads to cross.